And yet, collaborating with influencers can open doors for B2B brands to connect their value messaging to an audience that is actually interested. To provide some guidance around influencer marketing specific to business to business marketing executives, here are a few insights on everything from top challenges to brand failures, brand successes, best practices and the future. Agencies come in many flavors from specialized to full service to advertising focused to content focused. I think one thread of challenge that runs through all of them is finding the right talent to meet the needs of modern marketing – especially influencer marketing. There just aren’t that many people with years of deep B2B influencer marketing experience – except my team of course :). For B2C brands, there are big challenges regarding influencer legitimacy and the authenticity of their networks. Because there is so much ROI for the self-anointed and opportunistic influencers to buy fake followers, this is something B2B marketing leaders need to watch for as the behavior begins to bleed over into B2B. Compliance enforcement challenges. As FTC guidelines get more specific and the influence of GDPR reaches across the pond to affect data privacy regulations, brands have to figure out their processes and governance. B2B brands are running a little behind B2C in terms of influencer marketing sophistication and have not been investing as much in technology, staff or the influencers themselves. However that is starting to change and B2B brands are making great progress on engaging influencers for content across the entire customer journey to collaborating with more micro-influencers. Influencer are challenged too, especially when it comes to ensuring their compliance and “clean” networks to earn and keep brand trust. Big name influencers are now competing against many niche influencers as brands seek to lower their costs and boost engagement levels. Those big names will need to work harder on being effective vs. just being famous. Brands who view influencers purely as an advertising distribution channel really miss the mark on the opportunity that influencer relationships can bring. Pay to play has it’s place in both B2C and B2B influencer engagements, but when brands limit their view to a transactional engagement model only, they’re often disappointed with the results. Pay an influencer and they’ll be your friend for the day. Help someone become more influential and they’ll be an advocate and friend for life. More tactically, brands that use a shotgun approach to invite influencers only when they need them won’t see very high recruitment rates. The same goes for non-personalized, ego-centric messages from brands that are only concerned with what the brand wants to get out of the collaboration. For more specific examples, see this post on 50 ways to fail at influencer engagement. Our focus at TopRank Marketing is B2B content marketing collaboration with influencers, so our approach is different than working with consumer focused influencers. Longer sales journeys, larger purchase decisions that are often made by committees vs. individuals make B2B a very different animal in the influencer marketing world. Also, in B2B there is less “pay to play” so the importance of values alignment with the brand and true relationships is very high. Since B2B influencers tend to have more subject matter expertise than the media creation skills often found in B2C, the approach to recruit them often has to be based on how their collaboration with the brand will create value for their mutual audiences. B2B influencers will be more invested in the brand when the brand invests more in an ongoing relationship with the influencer. We’ve found that B2B influencers will be more invested in the brand when the brand invests more in an ongoing relationship with the influencer. One of the most effective ways to engage B2B influencers on an ongoing basis is through content collaboration. That content doesn’t always need to be a blockbuster campaign, either. Twitter chats, short quotes, quick videos and social engagement are all easy and impactful ways for brands to engage with influencers on an ongoing basis. Of course, different types of influencers have different motivations so it is important to approach them accordingly. Brandviduals play the exposure and fame game, so engaging them would be very different than engaging a cybersecurity engineer with a niche, but highly active audience. Always-on social monitoring and engagement are essential for quality interactions with influencers on an ongoing basis and especially when you are not working with them on a campaign. Software is essential for this kind of social CRM, listening and engagement. More effort to validate networks is important and I think social channels are moving in the right direction. Marketplaces that collect influencers for brands to engage need to do more when it comes to ensuring authenticity of networks and compliance. I’d like to see more improvements with influencer marketing software which tend to be very social media focused. I think there are some significant opportunities to integrate with content marketing platforms, analytics, CRM and marketing automation platforms. When brands “get it right” on recruiting influencers who are authentically interested in both the product/service and are genuinely active in the communities of interest, it’s a win for everyone involved. By developing relationships with industry influencers as well as internal subject matter experts, influential community members and clients, B2B companies can tap into resources that provide numerous benefits, especially when it comes to collaborations on content and events. The keys to success in B2B influencer marketing, more than anything, are relevance and relationships. I also think some of the B2B friendly influencer marketing platforms like Traackr, Onalytica and even our client GroupHigh are doing a fairly good job at innovating and creating features that help brands make the most out of identifying, managing and measuring authentic engagement opportunities. 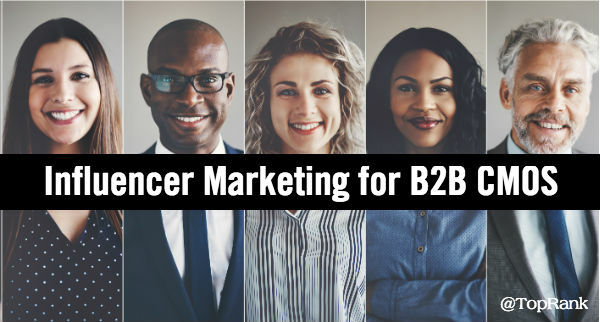 There are many examples of successful B2B influencer marketing campaigns and I am happy to say that many of these posts on other websites feature work from TopRank Marketing clients like SAP, LinkedIn, Content Marketing Institute, DivvyHQ, Cherwell Software, and Prophix to name a few. Everyone is influential about something and with 90% of B2B buying decisions being driven by peer recommendations, I think in the next few years we’ll see a lot more democratized marketing through brand collaborations with their customers and community as much as they do now with micro and macro influencers. It’s possible that as AI advances, avatar influencers become more accepted and brand mascots or personas come to life to engage customers. I have a feeling those avatar influencers won’t become much more than a novelty in B2B though. The more likely intersection of AI and influencer marketing is through big data analysis and the machine learning necessary to understand influence beyond social networks like Twitter and Instagram. Also, I think we’ll see greater sophistication with AI and its application to messaging influencers according to personas and rules based engagement models. Communications like information capture and invites to share may eventually be handled (in part) by messenger bots. More than anything, the future of influencer marketing will involve greater sophistication: for brands, for influencers and the communities that follow them. 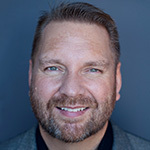 CMOs that understand what’s possible and what’s meaningful will see the greatest returns on influencer relationships to their brands and with their customers.